To offer all legal limousine and ground transportation company owners the tools, and information they need to run their business in a way that will benefit them, their peers, and the general public. The Arizona Limousine Association is a non-profit organization dedicated to providing educational support to the Arizona chauffeur driven transportation industry. We conduct educational seminars and provide a forum for the free exchange of ideas, and systems which enable our members to operate in a more productive manor. We provide our members with a mechanism for the dissemination of information on best practices, while providing the necessary education and resources to preserve and protect their ability to operate profitably. 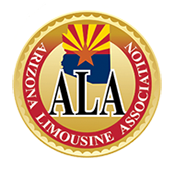 The ALA is dedicated to informing, educating and professionalizing its members – chauffeured transportation operators, suppliers, and vendors, as well as local and regional associations – to ensure the continued growth, development and prosperity of their own companies while providing a harmonious environment for limousine operators in the State of Arizona, while allowing them to compete ethically while learning from each other. To be the voice of the luxury ground transportation industry in Arizona on legislation and issues affecting the limousine and chauffeured car community, especially concerning Freedom In The Workplace for independent limousine contractors and operators. To provide a harmonious fellowship for limousine operators in the State of Arizona, allowing them to compete ethically while learning from each other.